Christmas 2017 is only a matter of weeks away now. I don’t know about everybody else, but I’m really looking forward to it. We’re pretty full-on here all year, and it only gets busier. Must be something absolutely wonderfully delightful about the local ladies in the Philippines, because Australian men seem to want to keep marrying them. I think the secret is out! More Australian Filipina relationships, more love and more marriages. And that means more Australian visa applications and more for us to do. There’s an expression which Australians are familiar with, and we call Christmas the “silly season”. Not the “sili season”. Nothing to do with consuming chilies. It means it’s a time when people often become a bit illogical and the emotions run high. People can get angry over things they wouldn’t normally get angry about. They want everything to happen in time to make it a perfect Christmas. From a visa perspective? People want to be together with their nearest-and-dearest on Christmas itself, which is perfectly reasonable. What can be unreasonable is forgetting certain logical facts, and that is that everyone else wants the same thing at this time. Plane tickets get expensive and plane seats get filled. Manila is full of traffic and shoppers. Staff at the Australian Embassy in Manila take holidays. Mail and courier systems overflow. Down Under Visa take holidays, thanks very much. Nerves get frayed. People get tired and in need of a break. Yet the visa applicants and Australian sponsors are ever hopeful of getting that visa at the last minute. This is a new application. It’s not an “extension” of the last visa, and no they don’t dig out your old application and say “Oh, it’s Bill and Marjorie! Nothing needed! Let ’em through!” So you don’t get off with minimal work or minimal documents and evidence, especially if you want the visa granted! You’re dealing with a professional, so don’t tell us how to do our jobs! I’m sure your surgeon or your mechanic don’t take kindly to you telling them how it should be done either. If we tell you that you need something more or something different, we do know what we’re talking about. Otherwise why engage us in the first place? 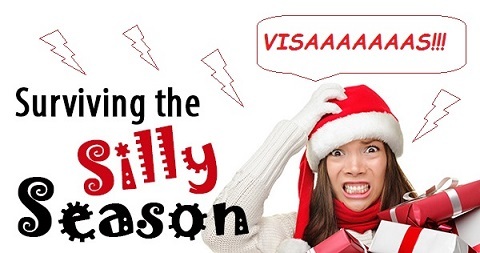 For those who do (and will) get tourist visas…..and hopefully flights!…..before Christmas? We hope you have a wonderful time together. Christmas remains a special time of year for both the religious and non-religious, and we all somehow realise that what matters in this world is the people that we love and who love us. I always remind my children of this. I enjoy business success and the fact that I can provide them and myself with some of the good things in life. However these children, my closest friends/relatives whom I love, and of course my wonderful wife Mila, they matter to me more than anything. Christmas means I can spend more time with them, and that’s really nice. I wish the very same for all of you, and may 2018 be a great year for you and may it bring you closer together both physically and in a loving way. NOTE: This is a re-posting of a post from November 2016 with a few updates.